No arguments: fake.exe (FAKE will try and locate your build script). Specify target name only: fake.exe clean (runs the clean target). Optional. The path to your .fsx build file. If not specified, FAKE will pick the first .fsx it finds in your working directory (and fail if none exist). Optional. The name of the build script target you wish to run. This will any target you specified to run in the build script. Options begin with -- (long name) or - (short name). Set environment variable name value pair. Supports multiple. Set environment variable flag name to 'true'. Supports multiple. 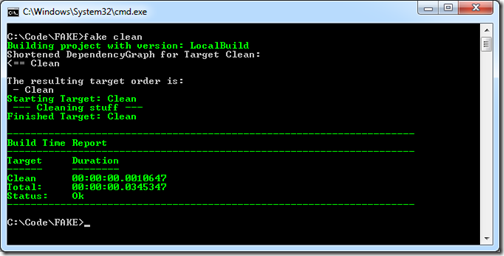 Set the build output log file path. Print details of FAKE's activity. Pass args after this switch to FSI when running the build script. This consumes all arguments after it. See F# Interactive Options for the fsi CLI details. The entire argument string following the build script path is set as the value of an environment variable named fsiargs-buildscriptargs. This means you can access this specific set of arguments from within your build script. Bootstrap your FAKE script. A bootstrapping build.fsx script executes twice (in two stages), allowing you to download dependencies with NuGet and do other preparatory work in the first stage, and have these dependencies available in the second stage.